A koeksister, as traditionally made by the Afrikaners, is a made from a doughnut dough, plaited, fried, and then dipped into syrup. It is served cold, some argue very cold, so that when you bite into the hardish exterior of the koeksister all the cold sweet syrup fills your mouth, before you eat the slightly chewy dough. I doubt I'm doing it any justice, it's hard to describe. I'ts a (very) sweet something that is as typically South African as biltong and boerewors. Now some people make their own. But I won't even begin to attempt that. Some things are best left to the experts. 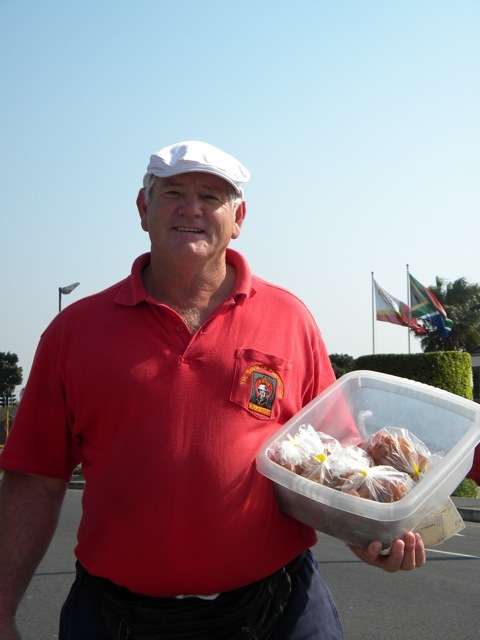 And the very best ones are to be found near N1 City Mall, where the ever-cheerful Arno Arpin has been selling koeksisters for almost 20 years along the side of the road. For a brief time, bureaucracy forced him to sell from a small stall inside the mall, but thankfully, he is now a free man again. You'll find him selling them at the informal trading spot at the traffic lights in front of the McDonalds. At R20 for 10 deliciously large syrupy, crunchy koeksisters, this huge sugar rush is an absolute bargain. Buy them, store them in the fridge, and when self-discipline fails you, eat them. Arno Arpin can also be contacted on 083 7370538 or on 021 5921819 if you wish to place orders before the time, and don't want to risk driving up the N1 only to find that he's sold all sold out and gone home for the day. Because nothing will piss you off more than that. oooh lekker water my mond nou! Hi, we are visiting Cape Town in June and I was wondering if you know whether he still sells them at the N1 City Mall? Mary from Ireland. Hi, hope this message gets to you in time. Mr Arpen is still selling his koeksisters. You will find him or one of his associates selling at the traffic lights near McDonalds at N1 City Mall. Look out for his trailer in the MacDonalds parking area. Enjoy! Ooh Sam, we always buy from him. They are simply the best. So glad to know another koeksister fan, Leo. And isn't Mr Arpin as sweet and lovely as the stuff he sells? There is one thing I cannot resist and that's a decent koeksister or three with a glass of ice cold milk on the side. Most ultra sweet things, e.g. doughnuts, koeksisters etc, go best with milk! @ Jane, what I really like about you is that you admit to a third koeksister. Not many woman would. But I'm partial to three myself. With milk. But the Cape Malay ones require unsweetened tea. 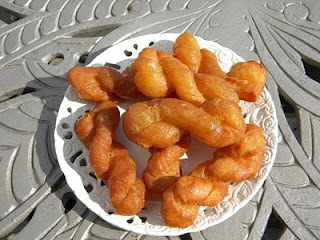 Ok I have just spoken to Mr Arpin and these look exactly like the koeksisters I am after, so I will head out and buy. I am just chronically worried about not nibbling on them between now and Friday.